When you’re browsing in a used book store, you might not want to buy something if its pages are covered in marks left by previous readers. For researchers looking to learn more about where a book came from and how it was used, though, such traces are rich sources. Annotations, inscriptions, bookplates, and stamps are evidence of the history of a book’s ownership. This history, referred to as provenance, tells a story about the book and its owners. Most of the items in the Rare Book Collection at Library and Archives Canada (LAC) passed through the hands of one or more owners before arriving here, and many of them bear physical signs of their former lives. LAC’s second copy of The Polar Regions, or, A Search after Sir John Franklin’s Expedition by Sherard Osborn is an interesting example. LAC acquired this book only a short time ago, in 2015, as a transfer from the department known at the time as Aboriginal Affairs and Northern Development Canada. But the marks on the book’s pages indicate that it has actually been the property of the Government of Canada for about a century. The book was printed in 1854. 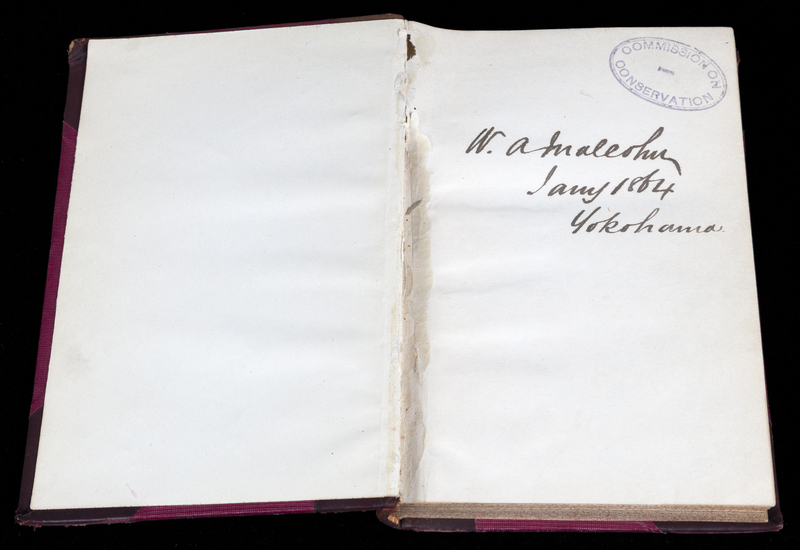 The oldest evidence of its provenance comes in the form of a signature on one of the pages that tells us the book spent some time in Yokohama, Japan, in 1864. Above the signature is an oval-shaped stamp reading “Commission on Conservation.” This likely means the book was part of the library of the Canadian Commission of Conservation. This commission was an advisory body established by the government to make recommendations on the stewardship of Canada’s national resources. It existed from 1909 to 1921; we can therefore guess that the book joined the public service during that period. In 1921, when the Senate was debating the Commission’s dissolution, one senator asked whether its “valuable library” would become part of the Library of Parliament’s collection. It seems that the books were instead distributed among the libraries of the various government departments that absorbed the Commission’s functions. This particular item’s Arctic subject matter made it a resource for the people responsible for the Canadian government’s administration of its northern territories. Over the years, this responsibility has landed with various federal bodies. The book apparently travelled with the staff who needed it, staying with them through several changes in bureaucratic structure. Much like the stamps on a passport, the jumbled departmental stamps on the book’s front free endpaper provide an illustration of its journey. After the closure of the Commission of Conservation in 1921, the book went to the Northwest Territories and Yukon Branch of the Department of the Interior (green stamp at bottom right), where it remained from 1922 to 1936. From 1937 to 1953, the Department of Mines and Resources took over northern administration, and got the book as part of the deal (blue stamps at middle and bottom left). 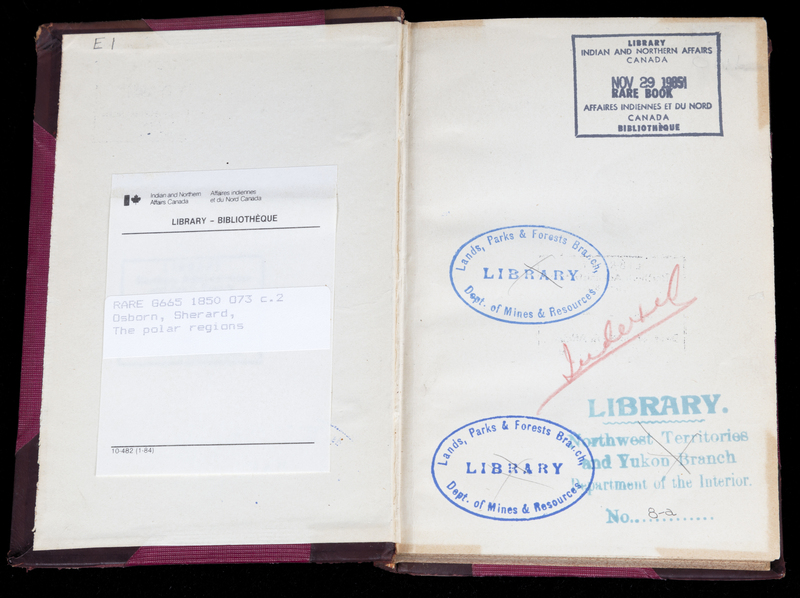 Ownership marks from Indian and Northern Affairs Canada (black stamp at top right, and bookplate on facing page) and the Department of Northern Affairs and National Resources (stamp behind Indian and Northern Affairs Canada bookplate; not visible in photograph) depict the volume’s continuing odyssey through the government. It is not always possible to glean so much from the traces of a book’s past. Still, next time you find a ratty old tome on a shelf, take a moment to look at what other readers have left behind. Maybe you’ll find more than you expect! Blog – From our rare book vault: What makes a book rare? Meaghan Scanlon is a Special Collections Librarian in the Published Heritage Branch at Library and Archives Canada. This entry was posted in Library and tagged provenance, published material, Rare books by Library and Archives Canada Blog. Bookmark the permalink. Years ago when I was working as the researcher for the Senate Agriculture Committee, I had the Library of Parliament borrow Upton Sinclair’s “The Jungle” from the National Library. It turned out to have been WLM King’s 1906 copy from when he was deputy minister of Labour (?). Lots and lots of annotations. Would make a great post, considering we are in the midst of reforming Canada’s food safety regulations and several of the recent blog subjects: WLM King’s diaries and this one on history of books.. Might be in preservation status based on a search of the catalogue. I know that 40 years ago it was in very poor condition, but a great read with all the pencil comments.